It is a Latin phrase, literally "What is permissible for Jove is not permissible for a bull" is often translated as "Gods may do what cattle may not". But you may read this as a memento mori, too. 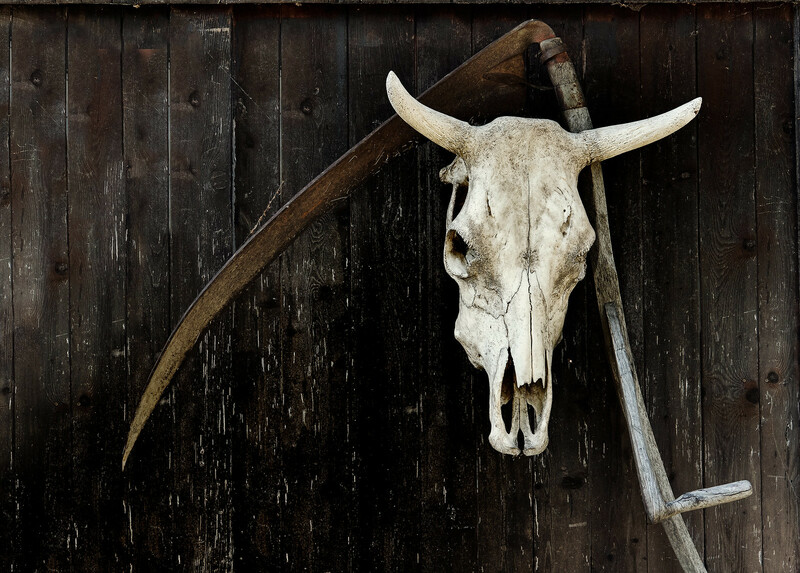 The Reaper certainly came for that cow but left his sickle behind. Very nice. I like the mental stimulation of your chosen title. This shows how much richness can be added just by a turn of phrase. Of course your design is interesting, of itself, but your title stimulates us to think more specifically in an area we likely would never have considered. But still you leave us to complete our further understanding ourselves. That open ended guidance is really helpful in art and science as it allows the observer who experience your work to personally contribute in an original way too! Did you just happen on this? This is a momentum found on the wooden wall of a small shed nearby ... no idea if the farmer did it with ulterior motives. In any case I was overwhelmed when I first saw it. I think it sums up his life: work with the cows and the fields! Probably only refers to man not the animals! Yep, exactly ... and nevertheless there is so much more "behind the scene" ... fascinating. I really like the symbolism. That scythe is as important and universal to Western Civilization as the Crucifix. In the hammer and sickle it has a perverse double meaning. Work of the masses and the way we will debate. If you disagree, first we hammer you and your family and if that doesn’t subdue you we cut off your head. That is actually a very, very long scythe on that picture.